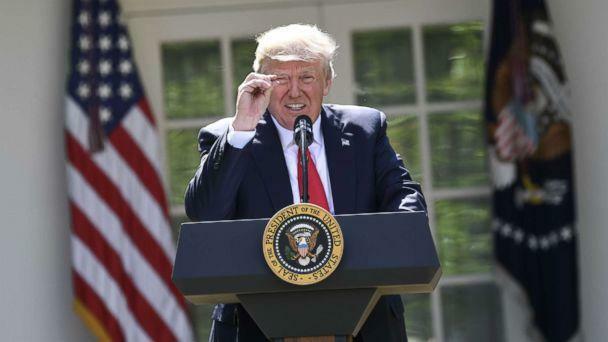 President Donald Trump has been a skeptic of climate change for years -- even making it a tenet of his 2016 presidential campaign -- and he took to Twitter to poke fun at the science on Thursday night by saying global warming may not be such a bad thing. Scientifically, climate change is measured over larger timeframes, not a handful of days, and not in one location. Last year was the hottest year on record, according to the National Oceanic and Atmospheric Administration (NOAA). Currently, 2017 is on track to be the third-warmest year on record, the NOAA says, behind only 2016 and 2015. The comment on the U.S. paying "trillions of dollars" is apparently a reference to the Paris Agreement, which the U.S. pulled out of in June. Trump cited the deal as being bad for the U.S. economy in a speech from the Rose Garden. With Syria's acceptance of the accord in November, the U.S. is now the only U.N. country not to be part of the 2015 agreement to curb greenhouse gas emissions. The quote echoed previous Trump comments where he cited currently cold weather and labeled global warming an "expensive hoax" in 2013.Trump also tweeted in November 2012 that global warming was "created by and for the Chinese in order to make U.S. manufacturing non-competitive." Despite Trump's disagreement, a federal report in November concluded people were the "dominant cause" of climate change on Earth. The study noted that "thousands of studies conducted by researchers around the world have documented changes," including the warming climate and extreme occurrences, and that its findings "are based on a large body of scientific, peer-reviewed research, as well as a number of other publicly available sources, including well-established and carefully evaluated observational and modeling datasets." On Dec. 18, Trump officially dropped climate change from the list of national security threats to the United States. His predecessor, Barack Obama, had named it to the list in 2015 when he prepared the country's last national security strategy document. He mentioned withdrawing from the Paris climate accord in the speech, calling it "very expensive and unfair." Trump's weather forecast is on point, so revelers in Times Square would be wise to "bundle up." The temperature is expected to be 12 degrees at midnight on New Year's Eve in New York City, which would be the coldest temperature for the ball drop since 1962.